If free printable games is what you’re looking for, you’re in the right place! Moms & Munchkins has loads of games that you can print for free. We have a variety of games like charades, scavenger hunts, word scrambles, word searches, trivia games and more. We have general games that are fun to play on any day of the year plus themed games for all the special holidays. We’ve sorted the games below by type. Simply click on name of the game you want and it will open up for you in a new window. Enjoy! All of these charade ideas come with a free printable game that you simply print, cut out the charades and then place them into a bucket to use during the game. Each team takes a turn selecting a team member to be an actor. The actor randomly selects a charade from the bucket and then acts out the charade while trying to get his team to guess the correct answer. 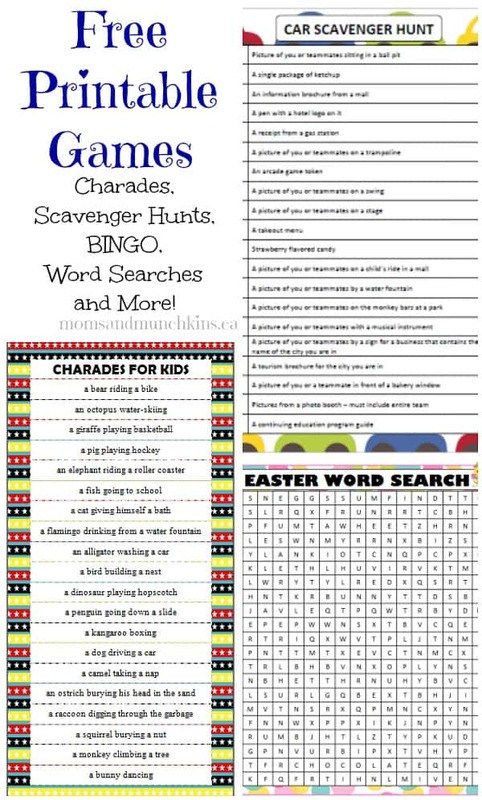 These free printable scavenger hunt games include ideas for both indoor and outdoor fun. Many of these ideas can be taken along on road trips to help pass the time while traveling. Have your little ones simply point out each item as they find it on the scavenger hunt list. You may also want to have a few small prizes on hand for some of these fun games. All of these free printable word searches come in a PDF format for easy printing. Simply print and have your little ones search for the hidden words. These word scrambles can sometimes be more tough than they look! The answers are always included on the free printable game just in case you get stumped on an answer. How good are you with fun trivia questions? These are all family-friendly games that you can play with your kids. These crossword puzzles come in a PDF format for easy printing. The answers are always included on the free printable game. These bingo games are very similar to the scavenger hunt games. The difference is that in bingo you try to find all of the items in any straight, horizontal or diaganol line. Here at Moms & Munchkins we’re always trying to think of new free printable games to create. Sometimes they don’t fit into one of the main categories above. Here are some more fun games to enjoy with your little ones. As always, we love to hear your ideas! If you have ideas for free printable games you’d like to see on Moms & Munchkins, feel free to contact us! We’re always adding new freebies for you! Stay updated on the latest ideas by following us on Facebook, Twitter, Pinterest and Bloglovin’.